The 2007 Fall Foray was held on October 6th and 7th and OMLA members were treated to beautiful weather conditions on both days. 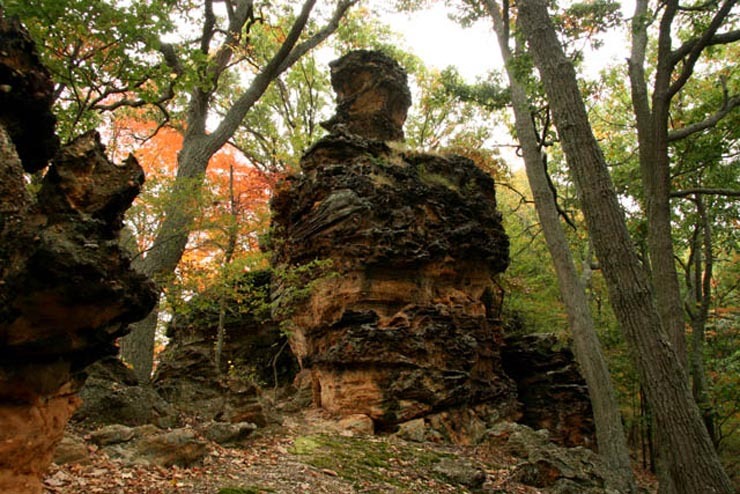 On the first day, Chimney Rocks was visited on Pike County, which is a privately-owned parcel with a high, steep hill consisting of sandstone and Sharon conglomerate cliffs and slump blocks near the top. In some areas, the exposed rock has weathered into tall spires resembling chimneys. The second day featured a trip to Scioto Trail State Forest in Ross County. This site contained a variety of habitats, but no rock outcrops. The lichen list for the Foray included 9 new county records for Pike County and 6 for Ross County. Additionally, the state-listed Canoparmelia texana was recorded at Chimney Rocks and Physcia pumilior at Scioto Trail SF. The latter species was first reported from Ohio during the 2006 Tuckerman Workshop. Due to its similarity to another common Ohio species, Physcia aipolia, diligent searching may turn up additional locations for this species in southern Ohio. A total of 32 mosses and 7 liverworts were reported from Chimney Rocks, including 7 county moss records and 3 county liverwort records. At Scioto Trail SF, 23 mosses were identified (no liverworts), one of which (Pseudotaxiphyllum elegans) was a Ross County record. A full listing of all lichens and bryophytes encountered during this foray can be found in the December 2007 issue of the OBELISK.